To Import customers into a WooCommerce store, first, you need to install WordPress Users & WooCommerce Customers Import Export plugin. On the website, to which you are importing the data, activate the plugin and navigate to WooCommerce > Customer Import Export from the dashboard. It will take you to the plugin page which will allow you to import and the customer data easily. The plugin takes a CSV file as input. That means that you need to have the data of the customers in a CSV file to import them into the website. When you go to the plugin page, you can see two different sections of the plugin. One is to import the data into the WooCommerce store, the second is to export the customer data and the customer metadata into a CSV file. In this article, we will be looking at how we can import the WooCommerce customers from a CSV file into the store using the plugin. From the plugin page, go to the Import Users in CSV Format section. You can import and export the data from a CSV file located on the computer or on a remote server. You can bulk update a number of existing customer data with the new or additional information in the CSV file. Mapping fields to ensure proper import of the data, especially when migrating from a different platform. Make changes to the user information in bulk during the import. Optionally send mail to every user after import. From this section, if you wish to update the existing users in the store using the CSV file, check the Update User if exists checkbox. This will take you to the Merge Users page of the plugin. If you leave the checkbox unchecked and click on the Import Users button, it will take you to the Import page. The next step in both cases is to upload the CSV file to the plugin. Now, based on the location where the file is saved, there are two methods by which you can import the customers to the website. Note: The CSV Import file must be in UTF-8 format. For more information about UTF-8 encoding, read How to save CSV / Excel File as UTF-8 Encoded? Method 1: Select a file from your computer. In this method, you can click on the Choose File button and select the CSV file saved locally on your computer. This method can be used if the CSV file you are importing is located on a remote server. 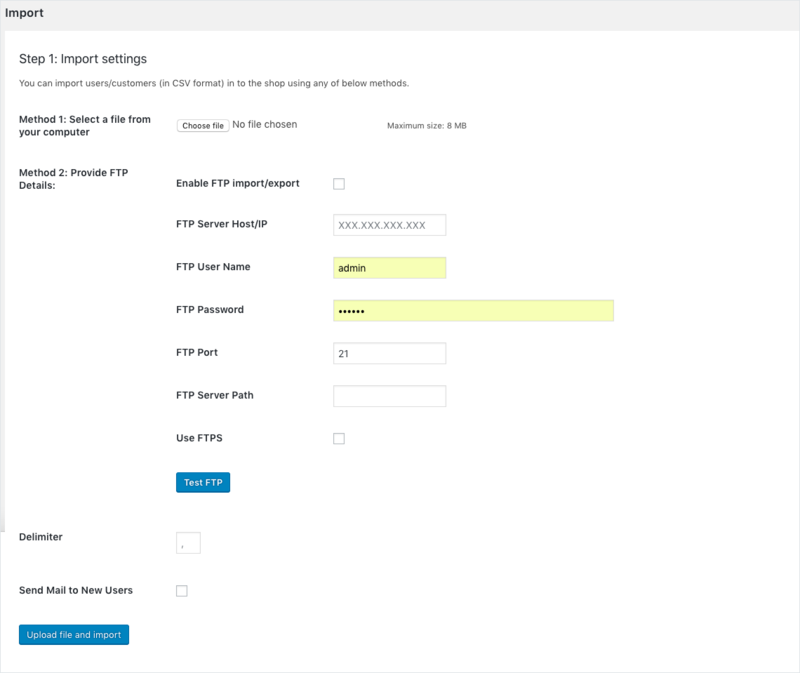 You can upload the file from the server by giving the FTP details of the server. After you have selected the CSV file with any of these methods, next click on Upload file and import. This will take you to the next step in import, mapping fields. The mapping fields are necessary for the proper import of the customer data into the WooCommerce website. This is to ensure that the column headers of the CSV file are in sync with the WooCommerce customer data fields. The mapping should be properly done if the data that are being imported are exported from some other e-commerce platform. After the mapping, click on submit, which will import all the data in the CSV file to the website. If you need more information on how to get started with the plugin to import or export WooCommerce data, then read this article. This entry was posted in Documentation, Knowledge Base, WordPress Users & WooCommerce Customers Import Export. Bookmark the permalink.